Improguise cast for this show: Megan Furniss, Brett Anderson, Ryan Jales, Leon Clingman, and Pete Faure with James Harvey making up the music. 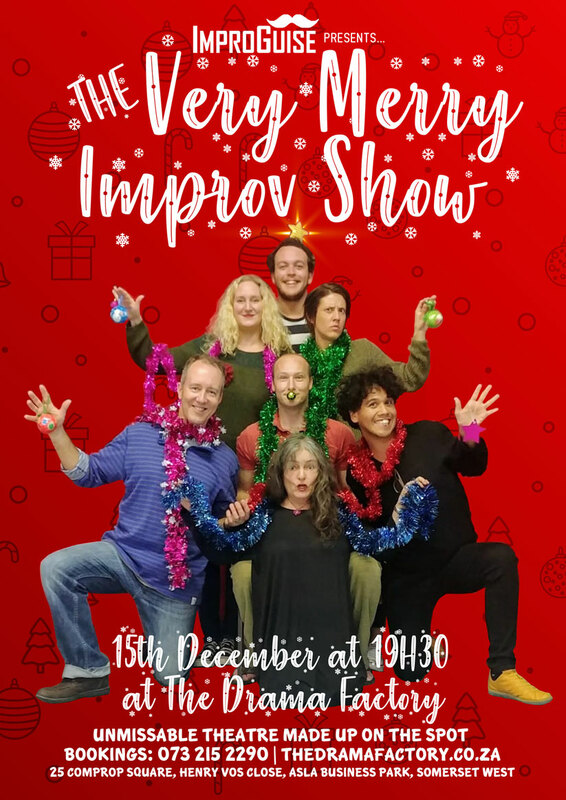 The Very Merry Improv Show ImproGuise, Cape Town’s best and longest running improv troupe plans to end their year with an absolutely jolly, totally made up, seasonal improv show, The Very Merry Improv Show. With their unique brand of improv, ImproGuise will be asking the audience for more than just a few suggestions and these will be used to spark off some crazy scenes. Anything can happen, and probably will! Be prepared for an hour of the cleverest and most rewarding made up entertainment. Performing that night are Megan Furniss, Brett Anderson, Ryan Jales, Leon Clingman, and Pete Faure with James Harvey making up the music. ImproGuise, Cape Town's longest-running, award-winning, Improv Company have been performing continuously in Cape Town and around the country for the past 23 years, bringing you the internationally recognised short form Improv, TheatreSports. They have also introduced audiences to other fabulous Long form improv formats; some that they learned from fellow improvisers across the globe, and some that they invented themselves such as: Superscene, On the couch, Period drama, Improvised Chekov, Tribute, Little Space between, Soapathon, Jam Sandwich, First Kiss, Last kiss, Musical, Naked Improv, The Chair, Stuck in the Middle, Wordplay and their annual Improv fest, to name but a few. They perform and teach at various theatres, schools, corporates and festivals both in South Africa and abroad.